Many people do not know the proper procedures for managing a crisis, which can result in injuries or death. The Red Cross of Eastern Pennsylvania sponsors Camp Save-A-Life each summer to teach kids ages 10 to 14 the proper way to handle disasters. The camp runs for seven weeks with a new group of campers every week. Participants become certified in CPR and First Aid while having fun and making new friends. The children were shy upon arrival the first day. That was short lived once the counselors started group games to get the campers comfortable. By lunchtime, the kids were formed into groups and conversing as though they’ve known each other for years. The camp counselors were engaged and passionate as well. Many have been leading the camp for years. When asked why they kept returning, every answer was the same- for the children, they enjoy watching them develop skills and get involved in activities. Each counselor had a story about the emotional impact of seeing kids take on new responsibilities. The camp creates a fun and competitive environment by dividing the kids into groups of six, with relevant names like lightning, hurricane, fire, tornado, flood and earthquake. They even have a student of the week who receives a disaster preparedness backpack full of emergency tools on the last day of the program. On the first day, the children were introduced to firemen of the Philadelphia Fire Department and taught how to use the hose on a fire truck. They are reminded to have an escape plan in case of fire at home. Over the course of the week, the children were taught different kinds of disaster preparedness. Lesson modules included Military 101, Conflict Resolution, CPR, Disaster Preparedness, and First Aid. According to a study by the US Department of Homeland Security, sixty percent of Americans have not practiced what to do in the event of a disaster. The American Heart Association found that less than twenty percent of Americans are equipped to perform CPR in emergency situations. One can only imagine the number of injuries and lives that could be saved if everyone was properly informed. Camp Save-a-Life spreads this knowledge to youth who can take the lead in informing their friends and families. For the camper, their parents and the camp counselors, being a part of the Save-a-Life program is an experience that is both fun and practical. I am currently serving as an AmeriCorps member at the American Red Cross Southeastern Pennsylvania. Our year of service is quickly coming to a close and we are already in our last rotations. I will be finishing out my year with the communications department, but I would like to use this blog post to reflect on my rotation at Red Cross House. Going in I knew very little about what my days would look like. I knew the statistics, but what I didn't know was all the work that goes on over there. The caseworkers spend many hours helping residents who are staying at Red Cross House following a disaster find assistance and residents spend many hours searching for a new place to live. Anyone who has looked for an apartment or house knows how stressful the process is, but imagine adding that to the stress of just having lost your home and belongings. When families first enter Red Cross House it is not uncommon for them to be overwhelmed. They have a daunting journey ahead of them. Soon, typically the day after they enter, they will sit down with their caseworker. The trained caseworkers go over what the family lost, what their recovery plans are, and what the next steps should be. After this first meeting you often can see that the family is visibly more relaxed, because they now at least have an idea of what to do to get back into a home. The road ahead is still difficult, but they have a sense of control again. Residents also take classes while staying at Red Cross House. Some classes offer practical knowledge, such as fire safety and financial literacy, while other activities are ways for the residents to have fun and decompress, such as yoga class or getting a free haircut. None of these classes would happen without our volunteers and financial supporters. In fact, Red Cross House would not run smoothly without the many volunteers who help at the front desk, serve lunch, teach classes, and offer counseling services, or the financial support to help keep the place looking nice. One of the things about Red Cross House that stands out to me the most is how quickly residents form bonds with each other. After all, no one understands what you're going through better than the people staying down the hall. It was not uncommon to see people sit down at lunch together and start talking about what had brought them to the house. Soon you would see them checking in on each other, and sometimes even helping each other look for a new place to live. I believe that the sense of community is one of the first things that helps people on their road to recovery, because they are reminded that they are not alone, and they see others who were in the same place as them moving back into a home. Spring cold snap is more than a nuisance, it is a fire hazard. The current spring cold snap is proving to be far more than just a nuisance. It’s proving to be downright dangerous. The cold temperatures reinforces the direct correlation between cold temperatures and the rate of home fires. After a record setting winter that saw the American Red Cross Southeastern Pennsylvania respond to more than 450 fires, those who work and volunteer for the Red Cross had hoped and expected the number of fires to decrease significantly. And after a few days of warmer weather, that is exactly what happened. But sadly, it didn’t last, in part to Mother Nature. Over the last 72 hours (since 4/15/14), as temperatures dropped to winter like levels again, the number of fires once again rose. In those 72 hours, the Red Cross responded to 12 fires, more than triple the 24 hour average. In all, the Red Cross assisted 21 families, 52 people displaced by those fires. Nine of those families are now at Red Cross House – The Center for Disaster Recovery. The American Red Cross Southeastern Pennsylvania is on pace to exceed 750 fire responses this year, the most in more than four years. But even if you don’t make a financial donation or volunteer, you can still help the Red Cross and more importantly the greater community. Even as the Red Cross is hopeful warmer temperatures will eventually arrive and the number of fires will decrease, the Red Cross urges residents to remain vigilant about fire safety. Residents should limit having more than two things plugged into one outlet and make sure dryer lint screens and heating system filters are cleaned regularly. Residents should also ensure they have working smoke alarms and have and practice at least twice a year a fire escape plan that includes pets. For more fire safety information, including how to create a fire escape plan, visit redcross.org/homefires. TV appearances, winning the lottery and deviled eggs – all part of a day’s work as a volunteer for the Red Cross. Although the real work of preventing and alleviating human suffering in the face of emergencies is done by Disaster Action Team volunteers (those are the folks getting the call in the middle of the night to go help a family who has just lost their home to a fire), there are opportunities to help the local Red Cross in ways that you might not have imagined. As a fundraiser by profession, I help the Red Cross Financial Development and Communications teams. In order to raise money, people have to know about what the Red Cross is doing! Through partnerships with TV stations and newspapers as well as the SEPA Facebook and Twitter accounts, the Communications team shares updates on preparing for severe weather, fire safety and other Red Cross events. They also work closely with the Red Cross fundraising team to share how donors can help. in Oklahoma (and in Philadelphia), many of the donors thanked me for my work, and it felt great to be a part of the Red Cross team. The highlight of the evening was when the woman sitting next to me took the information for a $5,000 donation – it felt like winning the lottery for the Red Cross. I’ve also worked at Red Cross events designed to raise money and honor our partners, the first responders. At the Bucks County Police vs. Firefighter Football Game I was in charge of twitter coverage and staffing the biggest celebrity there – Fred Cross! It was a beautiful fall day at Palisades High School. I played the part of a sideline reporter, interviewing the players and special guests, taking pictures and sharing game highlights. Some Red Cross events focus on donors (like the telethon), or the community (like the football game), but many Red Cross events are for our clients: those who have suffered from fires, floods or other disasters. This past fall, Red Cross House hosted a barbeque for the residents, and asked for volunteers to help prepare and serve the food. So, on a Saturday morning I found myself making hundreds of deviled eggs. There were no TV cameras. There was no twitter feed. We were just a wonderful group of dedicated volunteers helping. If you’ve wanted to volunteer with the Red Cross but aren’t sure how to begin, don’t let that stop you anymore! The mission of the Red Cross is so big and the work so expansive that there is a place for everyone to help. Find your perfect volunteering opportunity here! Lisa Piraino is a former employee turned volunteer with the American Red Cross Southeastern Pennsylvania. Philadelphia’s best chefs and dancing to live music. And there is profound sense of community: We come together to support the work of the Red Cross in our City of Brotherly Love because it embodies our most deeply held values. It’s a really special event. That said, let’s talk about the clothes! How often is there an occasion for a fabulous full length ball gown? What about those incredibly sharp tuxedos with the red satin cummerbund and bow tie? 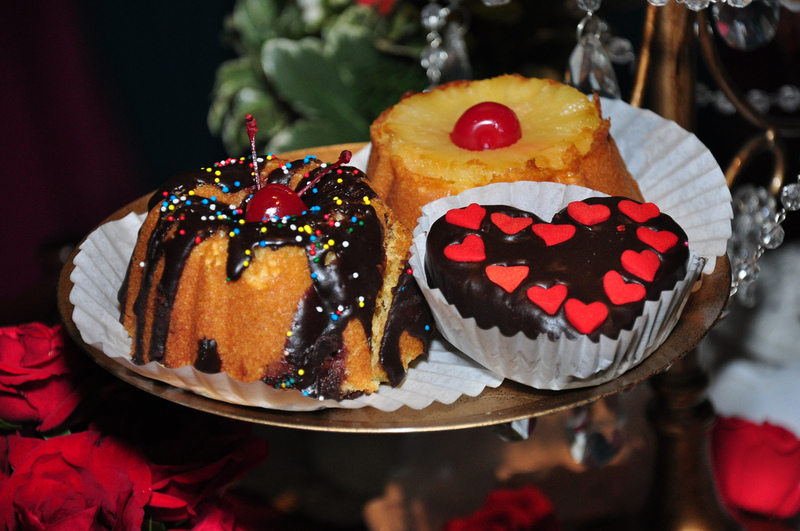 Still yearning to make up for that disappointing prom dress? Now is your chance. Treat yourself to some amazing attire. And guys, this is a formal occasion. Show your date, and the cause, some respect and look in an actual tuxedo. And don’t borrow Dad’s from the 70s. Stop by Black Tie Philadelphia. You’ll be amazed at how comfortable you are in one that actually fits. What’s the point in looking incredibly good, if there’s not a way to show off? The Red Ball has its own Red Carpet, and as soon as you place your foot upon it make sure to prepare for your Joan Rivers interview because that’s how stunning you’ll look. Professional photographers will be there to take a picture of your date, your mate, your friends and anyone else in your entourage. Check out some of the fun and finery from last year’s ball here. Did you know the Red Ball is a place where skilled chefs compete for your approval? They display their comestibles at several tables near the dance floor, and guests have the opportunity to sample, enjoy, and vote for the best by placing a special token in a box by each chef’s table. If you are a chef or restaurant representative and would like to be involved, check out this restaurant brochure. In the VIP room, fine Italian cuisine will be provided by Catelli Duo. At the end of the evening, the winner of the Red Ball Restaurant Award is announced. The Red Ball’s Auction and Raffle prize selection will include fitness, beauty, and entertainment packages galore! It’s so satisfying to take home a prize to remember the evening and know you supported a great cause – especially if the prize is something fun like tickets to a local sporting event or a massage at an excellent spa. Dance the night away at the 2014 Red Ball with the CTO Band. Since our very first Red Ball, the CTO Band has kept the dance floor moving. For those who enjoy softer jazz, George Veasley will return to play the Carousel Room and the ride will be open to Main Event guests. The VIP room will feature not one but two dueling pianists providing light background music. March is a great time of year for a party. Not only is spring on the way but March is also Red Cross Month. It is a time to recognize the efforts of our volunteers and staff and honor the roll of the Red Cross in our community. 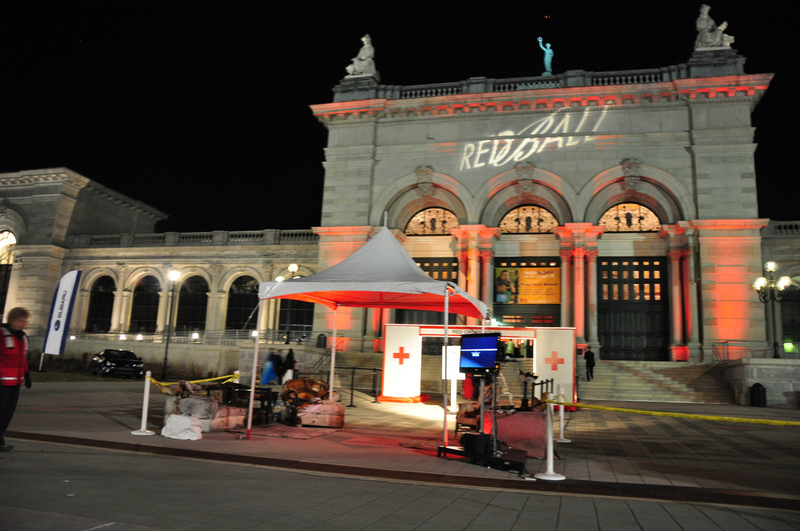 The Red Ball is a party with an essential purpose: It raises money for the Red Cross House and directly impacts the lives of those who have suffered devastating loss and who benefit from the kindness and generosity of our donors. Here’s your chance to create videos about a great organization and its wonderful people. You’ll have the opportunity to shoot and edit stories about responses to local disasters like fires, hurricanes, floods, etc. You’ll meet some of the most amazing people and get to document their work. You’ll create videos seen by hundreds of people, possibly thousands of people, many of them some of Philadelphia’s most influential leaders. It’s very possible your videos will appear on the national Red Cross disaster newsroom blog. You’ll be helping one of the world’s most recognized brands get the message out about its work. 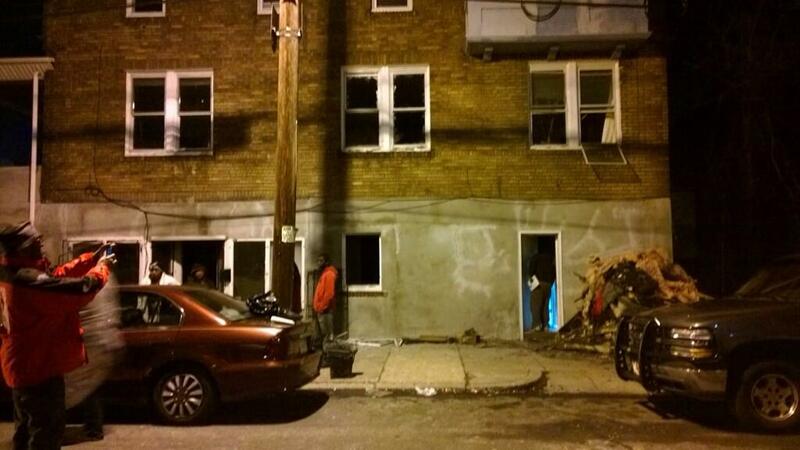 Go to Youtube.com/redcrossphilly to check out the kind of videos you’d be shooting and editing. You may also have the chance to work on a feature length documentary about our one of a kind Red Cross House – The Center for Disaster Recovery. Below is a description of the position and the skills we are seeking. College credit is not required, but highly preferred. Purpose: The video production intern will work to produce and edit videos for the American Red Cross Southeastern Pennsylvania that will be seen by many high level and influential leaders in the corporate, non-profit, and governmental worlds. Digitizing video clips and organizing them on internal servers. Ability to convert and save clips from Mac to PC and vice versa crucial. Assistance with special events, depending on the time of year, including media and client outreach ahead of events, setting up signage, social media during events, escorting of media and VIPs, filming interviews for Chapter, social media videos, etc. Editing and videography skills a must, experience with Adobe Creative Suite highly preferred. Must have access to editing and videography equipment capable of handling a variety of digital formats, plus microphone and lighting. Working knowledge of social media platforms such as Facebook, Twitter, YouTube and/or Vimeo. Must be able to handle multiple tasks at once. Ability and flexibility to work odd hours when necessary for special events with advanced notice or disaster response with possibly little to no notice. Must go through interview process, complete American Red Cross volunteer application and pass background check. Commitment to the Red Cross mission of helping to prevent and alleviate human suffering in the face of emergencies by mobilizing the power of volunteers and the generosity of donors. Creative vision with the ability to turn vision into results. Ability to work collaboratively, yet sometimes be able to work with little supervision. This is an unpaid internship but may qualify for college credit. One can’t help but be moved by the quiet and unassuming miracle that is Red Cross House – the one-of-a-kind short term disaster recovery center that graces University City, on the corner of 40th Street and Powelton Avenue. Although I’ve been volunteering in the Public Affairs Department for more than a year, Tuesday was my first visit to the House. Our group of employees and volunteers was there to help serve lunch to the residents. 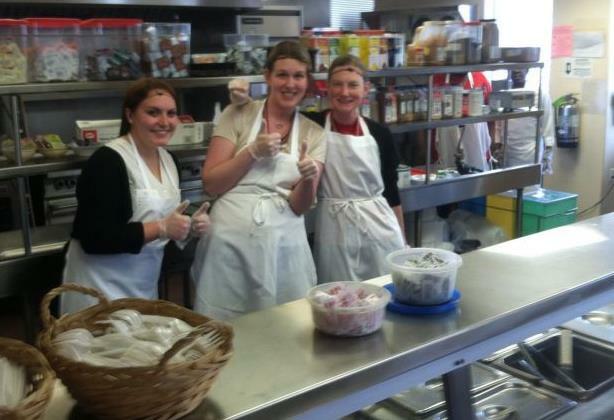 After a tour, my co-workers and I quickly got into the spirit of things and, with the help of the kitchen staff, washed hands, donned aprons and positioned hairnets. (Hairnets are a purely utilitarian device – meant to keep one’s pesky hairs from floating down into food. Sadly, they are not for the fashion forward.) However, once “hairnetted” in solidarity, we began welcoming current Red Cross House residents to a satisfying luncheon of lasagna, salad, macaroni and cheese and Salisbury steak. Our chef, Darryl Cook, serves three meals a day to an average of 30 clients. He’s had a very busy late winter as the House had over 100 residents for several weeks at a time. Our luncheon service was quiet by comparison; we served a handful of adults and three beautiful children. After a short time, we were able to sit down and sample Chef Cook’s food for ourselves. FYI – he makes a mean lasagna. I’ve heard a lot about Red Cross House in the year I’ve been volunteering, and I’ve written countless blogs and articles that mention its 26 private hotel-style suites, its casework offices, training rooms and counseling services, its outdoor playground and laundry facilities, and its heartbreakingly empty storage lockers. I already knew it was a special place, but I was amazed at the feeling of warmth evident during our visit. The foyer is surrounded by a colorful mural of happy and hopeful Philadelphians and there is cheerful artwork throughout the facility. The rooms are immaculate and private, with separate bathrooms. There is a children’s room, a den with a large television, a comfortable library and an up to date computer center. 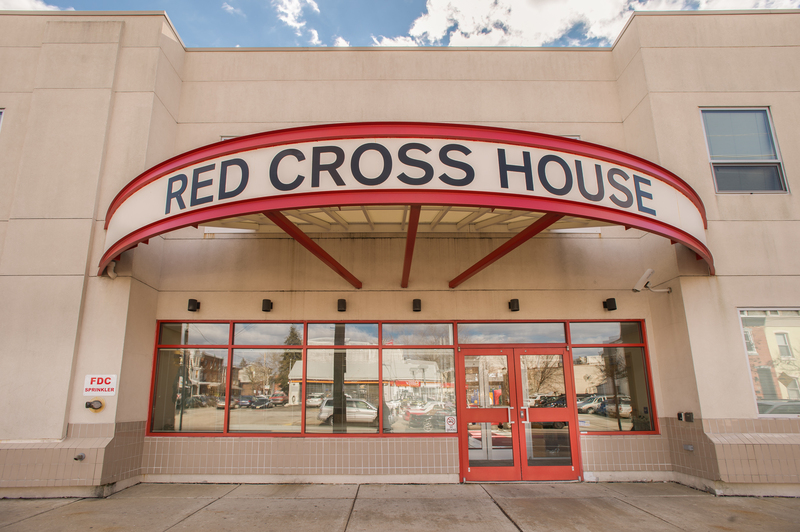 These amenities make Red Cross House a model facility, not just because it is bright and orderly, but because it communicates tremendous respect for its clientele. The message to people in our area who have suffered a house fire or other disaster is – you matter. You are worthy of our care and concern. You deserve the assistance of your community to get back on your feet and recover. Red Cross House’s recognition of its clients’ humanity and agency, despite their state of desperate need, is why it is successful. I, for one, feel enormously proud that it was built here, in Philadelphia.